MANAGUA, Nicaragua – As we veered onto the highway from the dark Managua side streets, my taxi suddenly filled with blinding light. The blatant glare came from both sides of the road where rows of massive lightbulb-covered yellow trees towered above. Ahead, a crew worked beneath a floodlight, pounding another tree into place. “They say it is a symbol of Nicaragua, but it doesn’t mean anything to me,” said my taxi driver, gesturing angrily to the nearest monstrosity. With 134 structures scattered throughout the city, the 17-meter-tall “Trees of Life” now completely dominate the city’s landscape. Theories about the trees’ meaning range from the benign to the fantastical. 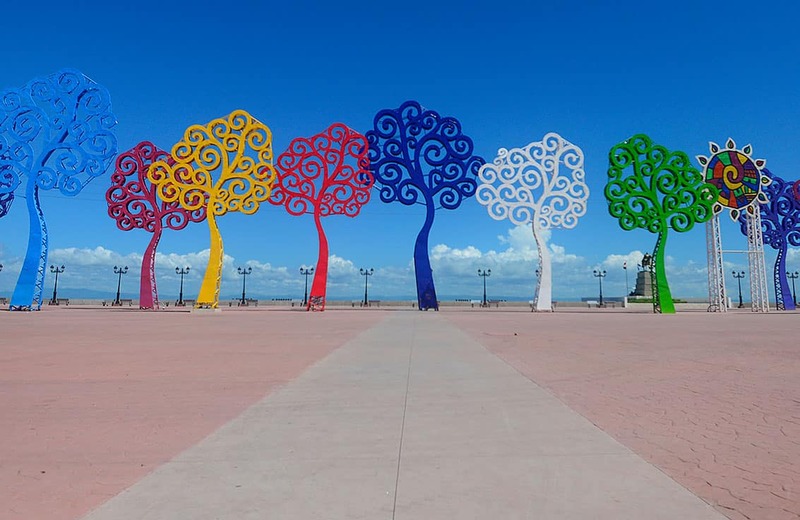 A common rumor in Managua is that the spirals in the trees’ canopies are actually upside-down sixes, symbolizing the devil. While no one knows the true symbolic meaning behind the trees’ design, the structures’ political significance is not lost on anyone. 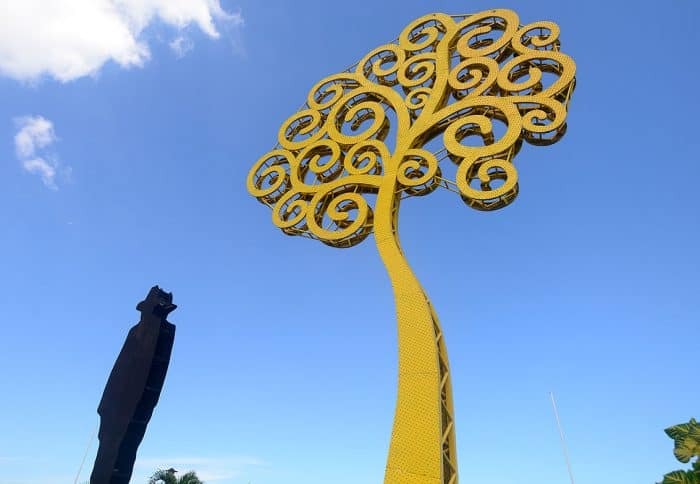 Designed by Rosario Murillo, the wife of Nicaraguan President Daniel Ortega and the Nicaraguan government’s official spokeswoman, the trees of life are a conspicuous example of the first lady’s far-reaching influence. Once unpopular with voters, Murillo has transformed her image to that of a kind of new-age spirit guide. Adorned in tie-dye dresses, long necklaces and bangles, Murillo is now constantly in the public eye, and opinion polls rank her as the second most popular public figure in Nicaragua. Despite her local popularity, Murillo’s metal tree reforestation project has been received with little enthusiasm from the public. Local media estimate that the trees have cost Nicaragua – the poorest country in the Western Hemisphere after Haiti – upwards of $3.3 million to construct and an additional $1.1 million annually in electricity bills. The trees have been springing up around Managua for three years now, and more are under construction. The behemoths have taken over virtually every public park and monument. 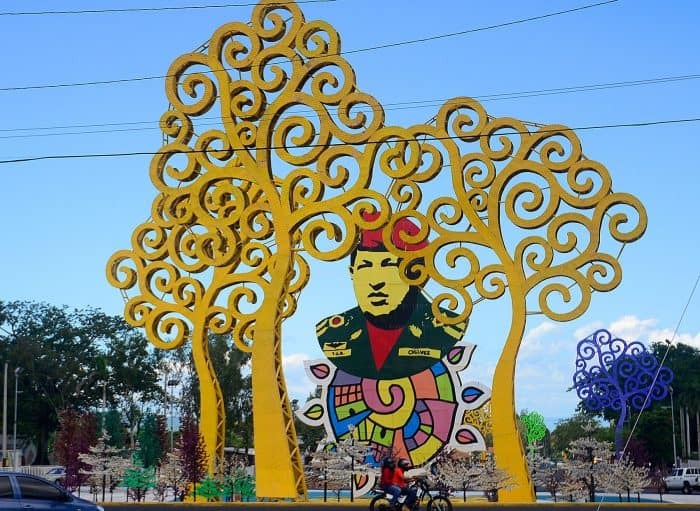 A cluster of trees surrounds a gaudily painted tribute to the late Venezuelan leader Hugo Chávez on the city’s main thoroughfare. Another tree of life stands next to a monument of Nicaragua’s revolutionary leader Augusto Sandino. Murillo’s taste for bright colors and quirky designs extends beyond the trees of life. Her style can be seen in everything from the twinkling lights decorating Nicaragua’s towns and cities to the neon pink lettering and sun designs on the Sandinista’s official campaign posters. Her presence throughout Nicaragua has become perhaps even more ubiquitous than that of her husband, now in his third consecutive term as president. As the official government spokeswoman, Murillo writes the lyrics for campaign songs and sets the official Sandinista dress code. Every day at noon, her breathy voice careens across the national airways with messages of peace, love and fraternity. The first lady’s omnipresence has led political experts to speculate that behind the scenes, she is the one pulling the strings, not Ortega. With the 2016 elections just around the corner, the husband-and-wife dynasty seems unstoppable. Managuans may be able to expect more trees of life cropping up in the future.